Today I was pretty tired, so I decided to drink only something "normal", so I decided to drink the last pieces of my 2006 Tea Expo Memorial Minibeeng. The particular tea is still available at Hou De for relatively reasonable price. This pu-erh is medium compressed, processed and made by Changtai Tea Factory, just like the 2005 Southeast Asia Memorial Cake. But while the 2005 cake is very heavily compressed, not very suitable to age in dryer climate, the 2006 minibeeng is of medium compression. As Guang wrote, this beeng was blended by Mr. Huang Chuan-Fang and the minibeeng was aimed to re-create the traits of aroma/taste of 50's Hun Yin Tie Beeng. Well, we will see if Mr. Huang succeeded in next 50 years. Dry leaves are OK, nothing spectacular, but good enough. Tea liquor is orange, I believe it's a bit darker than the photo shows. The tea is strong and pretty bitter, leaving long aftertaste. The tea isn't that strong (may I say brutal?) as another creation of Mr. Huang Chuan-Fang, the 2007 5th International Tea Expo Memorial Cake, but still leaves tickling tongue and fresh mouth feeling. No smokiness at all. The 2005 Golden Needle White Lotus is maybe the most famous and most appraised shu pu-erh made by Menghai factory in last few years. It won the 2005 China Tea Industry Exposition Gold Award. So is this tea really that good? I read somewhere that this tea is of "medium compression". If that's true, what is heavy compression? I was able to cut off enough tea from the sample, but also I made a pretty deep cut with my pu-erh knife into the surface of my table and I'm lucky that I still have all ten fingers. Certainly a hydraulic press was used to make this beeng! The leaves are small, consistent, with some yellow buds. The dry sample emits very strong aroma - partially it reminded me of bacon, with a certain earthiness (reminded me the smell a dry cellar with some wood deposited in there). The brew is beautiful - clear, dark, in direct sunlight it changes color into ruby. The taste - well, probably now is the perfect time to tell you, that I'm not a big fan of shu pu-erh. I drink shu in work, when there is no time to brew something better, but I do not seek it. Why? Maybe because I know, how shu is produced, and also here in Slovakia only pu-erh available was very, very bad shu, so I somehow disliked that kind of tea. Back to taste - the taste is smooth. Nice. Mellow. If you like the mustiness or fishy tastes in shu pu-erh, you will not find them here. Instead, the taste is sweet, woody, and earthy. In some reviews I read about floral notes - well, I do not found any of them. Just a very good shu, that last 8-12 infusions. Wet leaves were dark and broken - probably as the result of my humble attempt to break the sample into pieces. I tried a sample I got from Hou De (sold out). I also have two minibeengs (200g) I accidentally purchased just before the pu-erh bubble, but I decided not to open them, because of their quality. Let them sit at home and age. The tea itself is probably sold out anywhere for a pretty long time, you could try its two years younger cousin from Yunnan Sourcing - but at your own risk, since I do not know, how tastes the fresh one. Or you can try the more expensive aged loose variant. Today I decided to try something lighter, the "tasty tea". 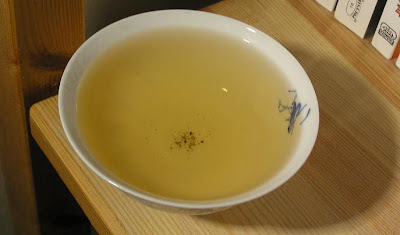 Since I'm big fan of Dan Cong oolongs and today I ordered lot of samples from Imen, the Dan Cong is the way I want to go. I got this particular tea from a local vendor, owner of Cha Dao, a tea house in Prague. I got four different Dan Cong oolongs from him, this is Yu Lang Xiang. You may also notice, that in Czech transcription the Dan Cong is written as Tan Chung. What says the website about this tea? Next example of 'Single Tree Phoenix' is one with the smell of Jade Orchid (Yu Lang). The tea is full of citrus undertones; the taste is full, straight with a bit of grassy tones. Also, you can find in the taste honey, nectar and sweet flowers. And how performed the tea in the reality? I prepared the tea in my 50 years old zhu ni teapot I use with Dan Cong oolongs with a traditional gong fu style, starting with very short steeping times and nearly boiling water. The taste was very pleasant, mix of flowers and fruits. To my biggest surprise, instead of usual citrus fruits I found in this tea a smell of... banana? Just a hint of banana. But... this taste is something I really like! Certainly, the tea isn't pure banana, it is a mix of banana, exotic summer flowers, orange, honey. The tea lasts long, 10 infusions at minimum. The taste does not change in such complex way as the pu-erh does, it remains pleasant all the time. Please notice, how huge these leaves are! I put one of the unfurled leaves on top of my teapot - the leaf is nearly longer than the whole pot. And this isn't the smallest pot I got! Also, you may notice how the leaf was processed - it's still green with some brown edges. And how I chose leaf that big? I just reached into pot and took the first one. Just for curiosity, 50 grams of this extraordinary tea (a bit less than 2oz) costs approximately $10. Good price! Only problem is, that the vendor sells tea only in Czech Republic. Fortunately, I visit Prague nearly each month, so maybe I can get a bit more of this tea to age in my next visit. Or I can wait until I tried the other samples - maybe some of them are even better. The 2004 and 2005 beengs are supposed to be pure wild arbor material from YiWu Mountains. The price of cakes reflects that fact - the 2004 beeng was sold for $90, and then price rose to $137. Still, the beeng sold out. The 2005 beeng was "only" $75 - maybe because it was sold out long before the 2007 pu-erh price bubble. Fact is, that the tea is beautiful, both the 2004 and the 2005 one. Love in the first sight. The leaves are uniform big, bold, strong. They are slowly turning brownish. 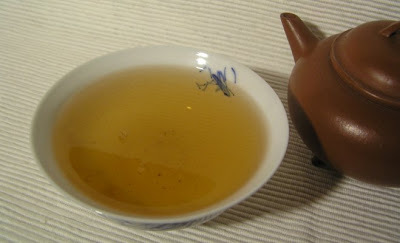 The liquor is orange with the typical Yi Wu taste - sweet, lingering with fruity background. No smokiness, at least I cannot detect any. Complex, yet still very tasty - this is the tea you can offer to your friend who does not drink pu-erh and he still will like it. The aftertaste is very good, too. The tea last about 8-10 very very good infusions, then it slowly gives up. Also check out about this tea : Pu-erh Community. 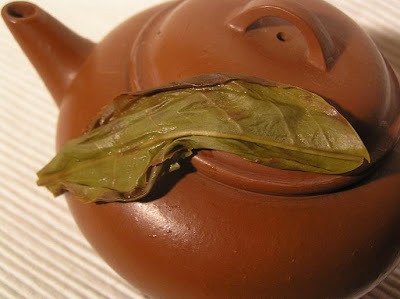 The most limited 2007 single region, autumn season San Ho Tang product, Xi Zhi Hao Da Xue Shan (Big Snow Mountain) was made from this mao cha - less than 200 kg of mao cha was available this year from that particular mountain. Available in USA only through Hou De, sold out within day or two. Since I ordered some beengs too (1% of all production :-), it will be interesting to compare the mao cha with the pu-erh. First impression - leaves are huge, dark green, some are yellowish (problems with processing? ), with few silvery tips. The smell is vegetal, really nice young tea. Liquor is of very light color, with color being a mixture of yellow and brown. The smell is very strong, very vegetal - at least in first few infusions. The smell is nearly too strong. But the taste is strong and the aftertaste is nearly the strongest I ever encountered. The taste is bitter with fruity background. Also, the tea lasts long, for ten and more infusions. I'm very excited about this mao cha and I'm looking forward to taste the beeng. I added a photo of one of the huge leaves - it's wider than my hand! Also, nottice the mighty and strong veins and the silvery hair. Simply beautiful! Today I tried a sample of Nepal oolong I got from a local tea dealer. He no longer has it in stock, so I can brew this only once. 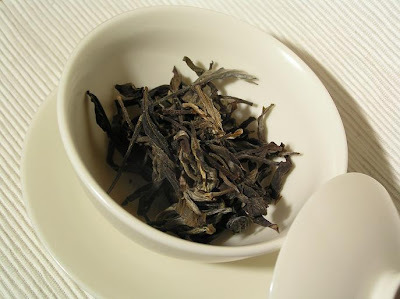 Leaves were pretty, mix of greenish-whitish-brown; they remind me of Bai-Lu white tea Guang at HouDe provided. The leaves were whole and beautiful. I prepared the tea in gong-fu style; this is how I brew anything, maybe except some green and black (red) teas in my office. I started with very short infusions and about 90 Celsius water. Taste - this was the second time, when Bai-Lu came into my mind. Nepal oolong, unlike Taiwan of Chinese oolongs reminded me of a mix of green and black tea, with the sweetness of black tea and liveliness of green tea. I'm still not sure, if I like that taste. If I have to choose, I would prefer spring Darjeeling’s with their mixture of black tea and fruits. The leaves were whole, except maybe of one in the centre of photo, which looked sick. I just opened a 25 gram sample of Mengku Guoyan factory pu-erh. And there was a wire and 2 pieces of wood. Hm, maybe a real hand-made product?